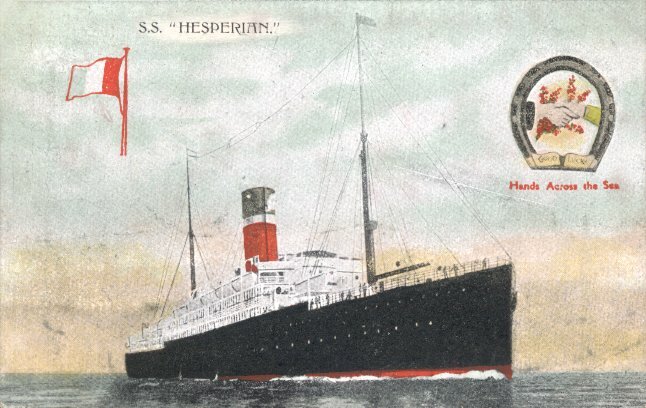 The Allan Line's Hesperian was built by A. Stephen & Sons of Glasgow. Launched in December 1907, she made her maiden voyage, from Glasgow to Québec and Montréal on 25 April 1908. Except for one Liverpool-St. John roundtrip on charter to Canadian Pacific, she served on Allan's Canadian service throughout her career. That career came to an abrupt end on 4 September 1915, when Hesperian was torpedoed off Fastnet by U 20, commanded by Cdr. W von Schwieger. Efforts to tow her to safety were unsuccessful, and after her skeleton crew abandoned her, she sank on 9 September, 130 miles (210 km) west of Queenstown. There were 32 fatalities, all occurring at the time of the initial attack.